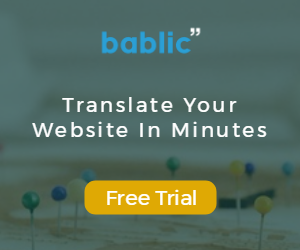 Expensive website translation is a thing of the past thanks to the cost-effective, easy-to-use platform, Bablic. Translating your website into any language is as simple as signing up, adding your site, and pasting a line of code into the header of your site. You’re then good to go and can start making use of the easy-to-use language translation platform. To ensure you get the most out of the Bablic platform, in the upcoming weeks we’ll be sharing a series of tutorials. We’ll start the series with the most popular feature – the Bablic Visual Editor. This is where you’ll be spending the majority of your time, so we’ll highlight all the features you can use. But, before you can reap the benefits, you need to access the editor. Signing in to your Bablic account where you’ll be greeted with the Dashboard. In the left menu, go to Visual Editor. You’re then taken to the following page and can start using the editor. 1. You have a top menu bar. Here you can access the various areas of the editor. We’ll discuss these in more detail shortly. 2. 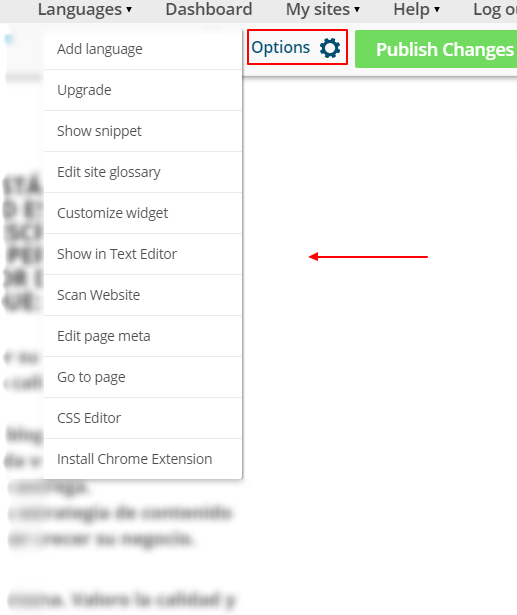 You can also change anything on your translated website by right-clicking any element and text, on your site. 4. You can make changes on any page by navigating your site as you normally would. Simply click on the links to get to the right page. This feature is also accessible from the Options tab. Simply click on Go to page and use it to navigate your site. 5. Any changes you make will only reflect on the translated website, not your original site. 6. Make changes for both desktop and mobile by alternating between the two. Find this feature in the top left of the Visual Editor. 7. When you’ve made all changes, click on the Publish Changes button. You’ll then be taken to this screen. 8. For the changes to appear on your live site you need to ensure that the Bablic code is in the header of every page. You can access the Bablic code at any time from the Options menu, under Show Snippet. Aside from on-page edits, there are several features that are accessible from the menus. Let’s get started with the top right menu. Clicking on the Language Tab you’ll be able to see all your languages, including the language of your original site. If you want to translate the language of your site to another language, click on Add Language. You can also return to the Dashboard that greeted you upon signing up. Add as many sites as you want under My Sites. This will allow you to manage multiple sites under the same account. The help function gives you access to a guided walk through, should you need help when you start using the editor. There’s also an option to contact us via email or by using the online contact form we’ve provided. Below the top right menu, you also have access to Options. You have access to many different features under Options. Click on Add Language like you did with the add language tab in the top right menu. You’ll be taken to this screen. Everybody who signs up has access to a two week free trial with limited machine words (words Bablic translates). Upgrading your account is as simple as clicking on Upgrade. You’ll be taken to our pricing page where you can choose your plan, starting with a basic plan of $15/month. The snippet is the Bablic code you need to paste in the header of your site should you want any changes you’ve made to reflect. There may be certain words that require a specific translation (Brand names, industry specific terminology, etc.) or that should not be translated at all. Let Bablic know by entering them into the site glossary. Click and you’ll be taken back to your dashboard to edit your site glossary. This is the language widget. As highlighted earlier you can also access this feature by simply right clicking it. The widget is fully customizable. You can change the colors and placement on your site. You can show flags or language name and even hide Bablic’s logo or the entire widget if you choose to. There’s also an option to customize it for both mobile and web versions of your site. For access to the in-text editor click on Show in Text Editor. Here you can see any edit’s you’ve made and make further changes. You can also filter the elements by status or use the search box to go directly to the content you are looking for. When signing up, Bablic scans your entire site. Click on the Scan Website if you want to exclude certain pages from the scan. Go to any individual page of your website, that you want to edit, by typing the page’s URL. Or simply click on any internal link in the site while in the editor. You’re probably not going to be using this function unless you’re a developer. But if you want to edit the CSS of a specific language, click to open the editor. We have also created a nifty Chrome Extension which serves as a support tool to the editor. Most users don’t need it, so please consult with our Support Team to see if this is necessary for you. Aside from machine translation, we’ve also partnered with translation service providers that can take care of your content professionally. To access this feature go to the top left of the visual editor and click on Human Translation. Select pages you want to translate. Based on your selection, Bablic will let you know how much it’s going to cost, starting with the lowest quote. In the next screen, you’ll be able to choose from several providers. Make your selection. That, in a nutshell, is the Bablic Visual Editor. The power of Bablic’s Visual Editor lies in the ability to make on-page edits to your translated website. Start playing around with the many features and contact us if you have any questions.